Welcome to Games Depot. Good game design for handheld consoles (Sony PSP), PC, or the browser. This section is for game programmers. If you like blackjack, then try the above Java applet (requires Java installed for your browser). Find out all the hidden secrets left by Kojima in the game Death Stranding. Mainly a PS4 walkthrough of all the easter eggs. Find out all the hidden secrets left by Kojima in the game MGS5. Mainly a PS4 walkthrough of all the easter eggs. Find out all the hidden secrets left by Kojima in the game Metal Gear Survive. Mainly a PS4 walkthrough of all the easter eggs. Find out all the hidden secrets in FFXV, including God Mode. Find out all the hidden secrets in Assassin's Creed Origins. The most popular PS3 webpage on the internet. Lots of information including secrets that the manufacturer doesn't want you to know. A speculation on what is in store for the future. This is the PS9 commercial that came out when the PS2 was released. Find out what future technology is in store for us. Ridge Racer seems to be ported to every platform imaginable (including the iPhone), and this section details its first appearance on the PSP. It includes all the car names for historical purposes. This game is a demo that utilizes the pathfinding algorithm from the "game algorithms" section. Click on link to download this awesome Starcraft Broodwar replay of one protoss human player against a team of seven computer opponents in melee! Save it in your Starcraft Broodwar replay directory (should be under the maps directory). No cheats were used. The basic strategy involved building cannons inside a neighboring computer base at the beginning of the game, then use the two bases to wall in and expand. Like its successor, this is a great addictive game from the past. The map name is Theatre of War. Disclaimer: Every effort is made to keep the website up and running smoothly. However, we take no responsibility for, and will not be liable for, the website being temporarily unavailable due to technical issues beyond our control. Our website may contain links to other websites of interest. However, once you have used these links to leave our site, you should note that we do not have any control over that other website. Therefore, we cannot be responsible for the protection and privacy of any information which you provide whilst visiting such sites and such sites are not governed by this privacy statement. 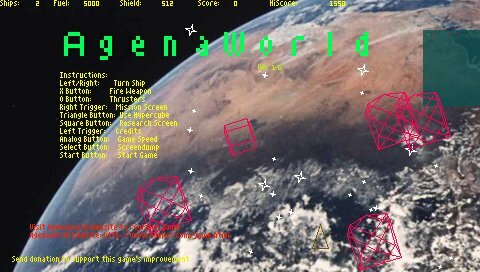 Agenaworld: A "Homeworld" type of game. Agenaworld is an original multiplayer PSP to PSP game that allow you to command a spacecraft to other galaxies and visit all eight planets (plus the sun and dwarf planet Pluto). In addition, the game backgrounds are real 24bit/pixel large space images that scroll in the background (courtesy of Hubble telescope). Try to reach Earth! Click on link above to download. 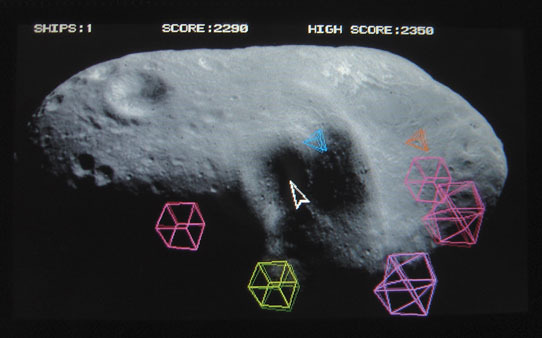 Press the "Triangle Button" to use the "spacegate hypercube" gravity assist. Requires latest custom firmware to run. In the near future, you captain a spaceship with extra-ordinary technology. Powered by nuclear fusion and fission generators and supported by ion micro-thrusters and gyroscopes, your ship can support long-term journeys. After a long travel in hibernation across the deep space, you come across the Juniper Belt and discover a mysterious asteroid surrounded by many "hypercubes". They are alien in origination, but one thing is known, when your ship touches one of the cubes, a gravitational assist field is generated around your ship. Firing an EMP afterwards, activates the field and your ship is slingshot at great velocity towards a destination pre-allocated by the respective cube touched. It is year 2492, the year that all eight planets plus dwarf planet Pluto are lined up end to end. With the help of the cubes, you are able to travel to distant galaxies, nebulas, and even all nine planets in the solar system, overcoming the laws of relativity. AgenaWorld for PSP is "donation-ware". Hold down LEFT TRIGGER in game and register so improvements in this game are made! Press button to donate now and get registered! LuLines is a program that allows you to view colorful patterns created with luminous lines. LuLines for PSP is "consumerware". If you like this program, purchase some posters or scrolls to support my efforts! You can donate and get registered now by clicking this button. World's smallest, simplest, maze generator. 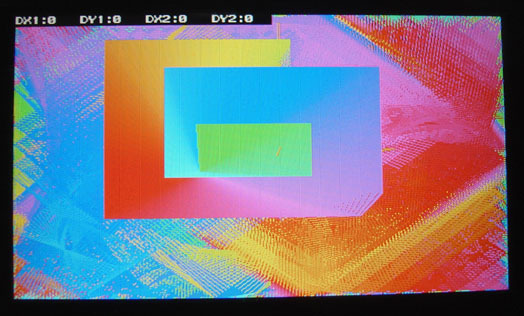 This "fractal" maze generator homebrew code for the PSP is the simplest way to create a maze. 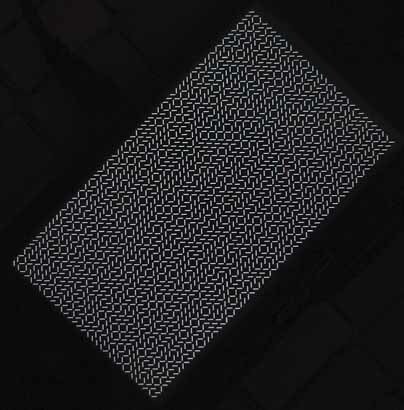 It uses fractal patterns to create the maze. To prove that the maze generator is the smallest code size and simplest code anywhere, look at the source code included in the download. (about 5 lines of code for the maze generation). Othello Space Invaders Wermz . However, external links to sites outside of edepot.com lead to sites that may have different privacy policies.